Lot # 36: Extremely Rare 1901 Chicago White Sox Program – Possibly The Only Known Example! 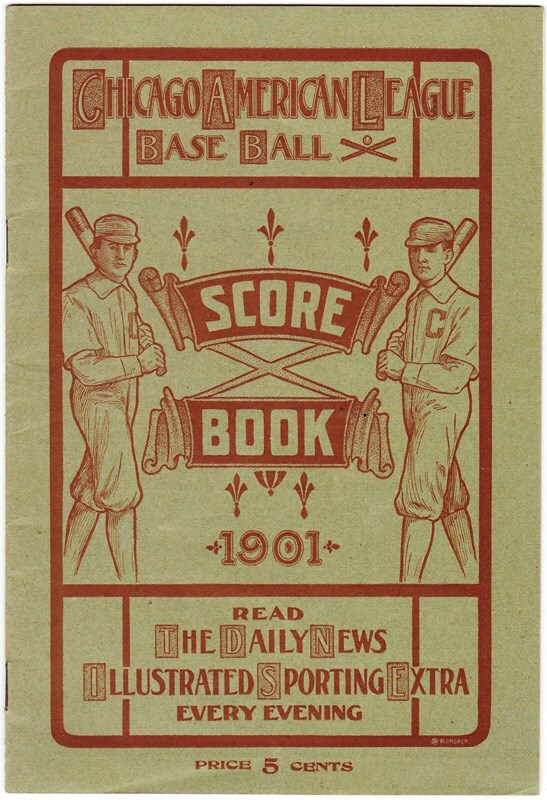 Extremely Rare 1901 Chicago White Sox Program – Possibly The Only Known Example! In 1901, the American League (AL) became an official "Major League", with the two of the eight teams including the Cleveland BlueBirds and Chicago White Stockings. Regarding Cleveland, it would be their inaugural Major League season, previously called the Cleveland Lake Shores in 1900. The powerful Chicago White Stockings were led by their renowned Hall of Fame player/manager Clark Griffith and would eventually win the AL title with an impressive 83-53 record. 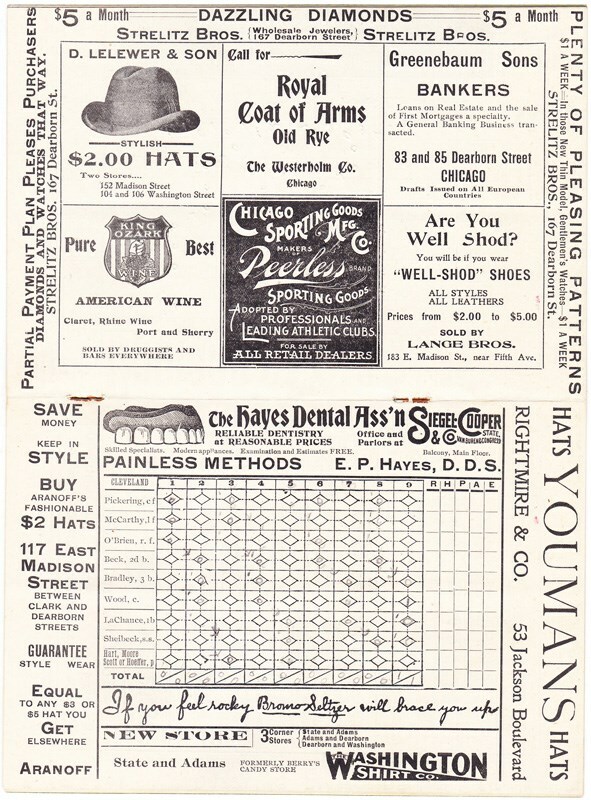 As an amazing artifact from that first AL season, presented here is an extremely rare 1901 Chicago White Stockings 5 cents scorecard that presents itself in breathtaking condition. To the best of our knowledge, this extremely rare 1901 program is a "one of a kind" artifact, originating from the renowned John Sullivan collection with Sullivan previously being one of the foremost publishing collectors extant. In fact, its excessive paucity level is solidified by the fact that the Chicago White Sox museum does not even possess a single 1901 program from that inaugural AL season! The ultra-flamboyant front cover reflects an orange/red print on an off-white surface, with two imposing White Stockings dressed batsman situated near each edge and separated by a "SCORE BOOK - 1901" text. The upper and lower portions boldly and respectively read: "CHICAGO AMERICAN LEAGUE BASEBALL", and "READ THE DAILY NEWS ILLUSTRATED SPORTING EXTRA EVERY EVENING." 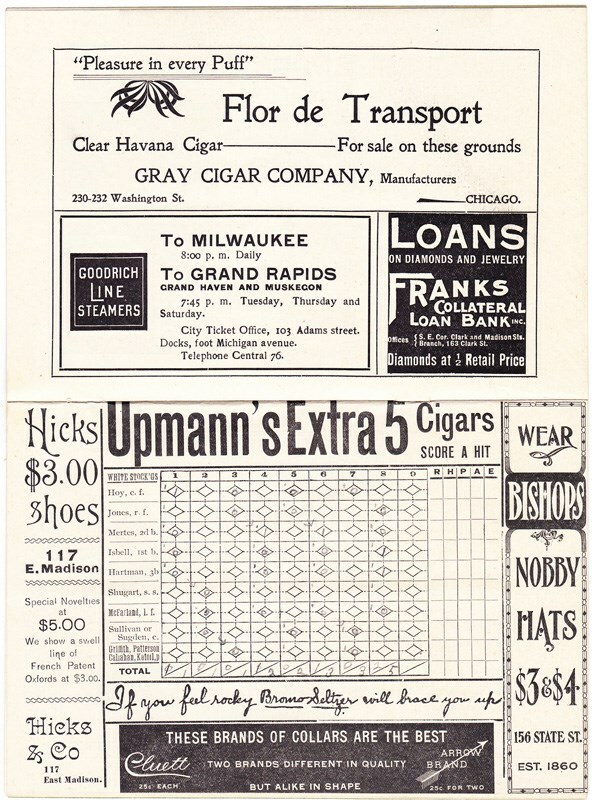 The inside scorecards have been neatly scored in pencil, with Griffith's hallowed name listed as a pitcher at the bottom of the White Stockings page. Line-ups include the following players: CHICAGO WHITE STOCKINGS – Hoy, c.f. ; Jones, r.f. ; Mertes, 2d b.; Isbell, 1st b.; Hartman, 3b. ; Shugart, s.s.; McFarland, l.f.; Sullivan or Sugden, c.; Griffith, Patterson, Callahan, Katoll, p. CLEVELAND BLUE BIRDS – Pickering, c.f. ; McCarthy, l.f.; O'Brien, r.f. ; Beck, 2d b,; Bradley, 3b. ; Wood, c.; LaChance, 1b. 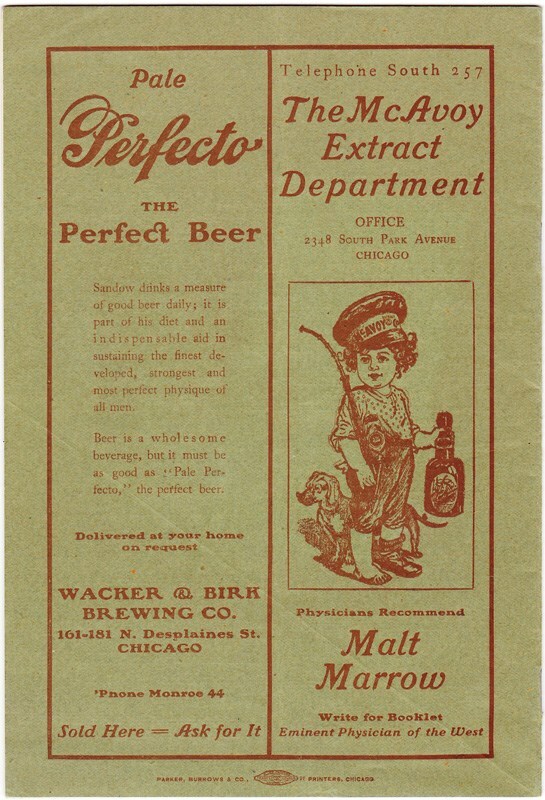 ; Sheibeck, s.s.; Hart, Moore, Scott, Hoeffer, p.
Both the scorecards and the back cover exhibit some incredible period style advertisements, with only some peripheral wrinkles evident (note attached pictures). The staples are fully intact and no glaring blemishes are apparent within the entire scorecard. Ironically, the actual first game of the AL 1901 season just happened to be the Chicago White Stockings vs. the Cleveland Blue Birds, and while this program does not represent that inaugural game, it does reflect a match between these two teams during that fabled 1901 season. A magnificent heirloom, it conjures up memories of our National Pastime's earliest 20th century origins, meriting a final resting place in any world-class collection!